KARISIMBI ONLINE NEWS: Have You Ever Wondered Why a US Based Enough Project Organization Is Guided By Hatred Against Hutu Communities In The Great Lakes Region? Have You Ever Wondered Why a US Based Enough Project Organization Is Guided By Hatred Against Hutu Communities In The Great Lakes Region? framework that I think is practical to ending insecurity and crimes continued being committed against innocent Congolese and the Rwandan Hutu refugees in DRC. I hope that by the end of this letter all stakeholders, especially Enough Project, international community, Rights bodies, UN peacekeeping mission (MONUSCO), Congolese Government, Kigali government, US government, and the Great Lakes Council on security and peace in the region would have understood that the FDLR issue is not as simple as the Enough Project puts it. If it was as simple then it could have been solved in the last 20 years. As we young people mature as FDLR gets more support from patriotic youth who want nothing else but the truth about what really happened in Kigali in 1990s. As we experience Western democracy the more we want Rwanda to embrace true democracy and embrace all her citizens regardless of their political ideology. 1. Making sure the Hima regime in Uganda stay for generation by supporting President Yoweli Museveni at any cost through both military and diplomacy support. This will ensure that the Bantu people of Buganda never rule in Uganda so that the US interests in Southern Such as oil exploitation remains in the hands of American oil companies. 2. Making sure that the Tutsi regime established in Rwanda by the Clinton administration lives forever through the Tutsi succession so that Paul Kagame and other Tutsis continue to oppress Hutus so that American business companies have enough access to mineral rich Eastern DRC through Rwanda. This is achieved by the ENOUGH PROJECT programs that spread smear campaigns and rumour mongering against the Hutu rebel movement FDLR calling the members of the FDLR mostly as young as 20 years of age to be genocidaires so that they will never attend schools but remain in the bush and die there either of kindnesses or Rwandan military operations. 3. Making sure that the people of Congo never experience any democratic regime so that the American illegal companies that are illegally mining in Congo continue to make profit whereas women, children, and girls are being raped on daily basis by the Tutsi backed rebels. This will ensure that US interests are safeguarded at the expenses of lives of Hutus and Congolese people. 4. Making sure that Hutus and Congolese educated people who live in western countries do not have platforms to tell their sides of the story. This will be achieved through the events that ENOUGH PROJECT organizes across America telling lies on what is truly happening in Eastern DRC, Rwanda, Sudan, and Uganda. 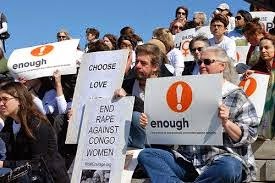 These meetings organized by the ENOUGH PROJECT would target programs organized by the friends of Congo and other Congolese and Rwandan diaspora programs. 5. Making sure that there is no Hutu or Congolese scholars who understand better the Great Lakes conflict get a job in international think tank such as the ENOUGH PROJECT because it can hinder their propaganda machinery designed to spread rumours about Hutus and FDLR. Once this is done then there is no balanced voice for the sufferings of the Hutu people found in Rwanda, Burundi, in Masisi, Rutchuru, and Walikali in Congo, and Bufumbira in Western Uganda. 6. Making sure people who support the dictators in the great Lakes region such as Kagame, Museveni, and Kabila get key positions in the ENOUGH PROJECT so that they can influence research outcome of the organization research and publication desk. This is emphatically put to the recruitment desk to make sure as many Tutsis are recruited in order to be given a platform to spread their lies and continue branding FDLR as a gang of genocidaires and yet as we have seen majority of the people fighting in FDLR have never been to the Rwandan soil are just children who are fighting to have rights to go back to their ancestral home. 7. Making sure that Rwanda will never have democracy so that there is a never ending chaos in the region to make relevant of the US activities in the region such as the ENOUGH PROJECT which is not after making peace in the region but making sure Hutus are exterminated and neutralized at all the ages so that the Tutsi regime in Rwanda remain in power despite many human rights abuses Kagame has been committing as stated by the Human Rights Watch and other rights organizations across the planet. To achieve this propaganda, we have seen the ENOUGH PROJECT continues publishing non-factual and biased reports such as the one published on Nov 18, 2014 entitled:” How to Dismantle a Deadly Militia: Seven Non-Military Tactics to Help End the FDLR Threat in Congo” of which I am going to delve into it here below so that we can expose the work of Enough project in details. After this article you would have understood that ENOUGH PROJECT is not after the love of Africans but one of those western mechanisms designed to destroy Africans and loot their natural wealth. 1. A comprehensive strategy that incorporates both targeted military approaches and more concerted diplomatic action on non-military areas: Allow me to remind you that now most of us are below 30 years of age and have been following up the issues of Rwanda, Enough Project, FDLR, and regional politics all our lives. You have always suggested comprehensive strategies since we were refugees in Kibumba, Mugunga, Kahindo, Nyangezi, and others. One of those strategies was to come and destroy the Rwandan Hutu refugee camps of which you felt that Mr. Kagame was not going to continue lead an empty country. You strategized and came. You gave Kigali bombs and ammunitions to shoot at us. RPF, UPDF, and Kabila killed whoever they could. You took the weak ones back to Rwanda and separated babies from their mothers that are how some of these young boys in FDLR found themselves in the jungle of Congo. By then you were sure that you had solved the Hutu refugees’ problems. However another monster was going to be born out of your calculated strategies designed to keep Paul Kagame in power. All this involved the straggles you mentioned here above which included military concerted efforts from Burundi, Uganda, Congo, and RPF and high level diplomacy when you sent Sadako Ogata, Louise Arbour to the refugee camps in Tingitingi to come and tell our relatives that they must go back to Rwanda or you will let them die in the jungle forest. Indeed most of them died but still some survived that is why we know talk about FDLR. Your strategies then involved the same things you are talking about right now: military concerted efforts and high ranking diplomacy which involved the UNSC to make sure we are branded criminals but we are still alive and live both within and outside Rwanda. Did you win then? 2. Incentives to increase defections: here you remind me when we were children in the refugee camps of Kahindo and Katale. You told UNHCR to reduce food ratio for Hutu refugees so that our mothers go hungry and we get Kwashiorkor so that you can force people to go back to Rwanda. It is true many of us suffered from hunger because of your ambitions to support the regime that even the Human Rights Watch, BBC, and UNHRC call a criminal regime. We went hungry and you waited for millions of Rwandan Hutu refugees to go back to Rwanda, but they didn’t. Did you win then? 3. Humanitarian steps and criminal accountability: Dear ENOUGH PROJECT please doesn’t preach water and take Amarulla. You are talking about humanitarian actions whereas here in DRC we have more than 300,000 refugees including children as young as 0-5 years old. You have never written any report highlighting the plights of these children. You have never talked about immunization of these Hutu refugee children. You have never thought of their future and their lives today. Now you are talking about humanitarianism? For who? Maybe for Banyamurenge refugees of whom you have been keen to advocate for but don’t talk about humanity because we have never seen it throughout your actions. You talk about criminal accountability. You are right M23 killed innocent people in Rutchuru, Kiwanja, Bunagana, and Kibumba. You were there I met your researchers on the ground. They never mentioned the brutality of the M23 because it was an outfit of your henchman Paul Kagame. You have never taken anyone to court. BBC has made it clear that Paul Kagame shot down the Rwandan presidential jet which is, under international criminal law, is a terrorism act which deserve an international concerted judicial effort. What happened to your humanitarian values and rights-defending attitude? I think you should give Hutu people in the region a break if it is suffering in your hands we have suffered enough and we are not going to take it any longer. 4. To ending the FDLR’s ability to continue to threaten peace and security in the region: Dear ENOUGH PROJECT, when you start talking about ending FDLR’s ability, you forget that FDLR does not need any financial support because it stands an ideology for millions of Rwandans. As you might notice in this letter someone who is writing to you right now is an educated 28 years old Rwandan refugees. In fact FDLR does not know me that I am their supporter but I am. Why? Because they stand for the plights of millions of Rwandan and Congolese people who need peace, stability, freedom, and are tired of western imperialism which come to Africa under the umbrella of bringing peace into the region but what you leave with us Africans is nothing but pieces. Therefore, you can fight a military war but you can never defeat ideology. Because it is about people believes, values, aspirations, identity, definitions, and most importantly, patriotism. Therefore, I wanted to let you that there are more than a million of us out there who are ready to support FDLR psychologically and morally until we set all of us free. You speak of a threat to peace and security in the region. When you visited the region, especially the Eastern DRC did you ever bother to reach out to communities in Masisi who have intermarried with FDLR members? Have you ever noticed that when you sent Kigali to come and bomb these innocent people they don’t run toward RPF or FARDC but to where FDLR is? Once you answer the above questions then you should go back to reframe your strategies because they are more western oriented than “Afrikanism”. 5. A follow-up report will review military steps necessary to address the FDLR: Before you continue wasting your resources doing things which are not necessary fruitful like writing the SEVEN RECOMMENDATIONS you put here below, let me advice you how to review military steps necessary to address the FDLR ghost: a) Talk to Kigali and let them know that what treated the Compaore syndrome in Burkina Faso is not far away to cure the Rwandan cancer of the “Je suis l’homme fort de Kigali”; b) tell Kagame that Rwanda does not belong to individuals but the people of Rwanda that you have oppressed for the last 20 years and they are taking notes; c) There is only one hope to give people rights to exercise their democratic rights by choosing their own leaders then FDLR can come home peacefully and become valuable Rwandans who contribute to the society; d) ask him to go and learn how Burundians and South Africans sorted out their differences and tell him that is the better way out of this mess before it is too late; e) truth justice, reconciliation, and forgiveness commission that is the only solution to address the FDLR ghost. Once you do this then you can give yourself a credit of being a peacemakers otherwise your biased attitudes towards Hutus and Congolese people has become too much through your reports and so called publications which are source of continued suffering of the people of this region not a solace as your name once suggested. 1. Regional diplomacy. U.N. Special Envoy Said Djinnit should continue to proactively repair relations between Rwanda and South Africa. FDLR existed in tough times when no one wanted to be associated with it. Tanzania expelled Rwandan refugees in 1997 of which some of them had no options but to cross over to DR Congo and join FDLR. These are the same people fighting for their rights today. UN has never liked FDLR because the UN is the sole reason why FDLR exists today anyway. UNSC is among those who helped Kagame to take over Rwanda and you have never allowed Rwandans to enjoy democracy as the one you enjoy in your countries and now you think that your hatred for FDLR will solve Rwandan problems. FDLR has been attached more than 85 times since 1998 to this day and they still get stronger so if you are still looking for ways to murder more than 300000 Rwandan Hutu refugees you have not been able to kill in the last 20 years we are here to let you know that your evil plans against FDLR will never work. They will all fail the same way the ones killed masses of Hutus in Tingi-Tingi never succeeded. In fact continued killing of Hutu refugees in Congo you create more recruitment ground for us to join the fight because we fight for our belonging so we will never wane away. 2. Cutting off the FDLR’s economic lifelines: charcoal. U.N. Special Envoy Said Djinnit, U.S. Special Envoy Russ Feingold, and U.N. Special Representative Martin Kobler should press the U.N. peacekeeping mission (MONUSCO) and the Congolese police to support the Virunga park rangers of the Congolese Institute for Nature Conservation (ICCN): Dear ENOUGH PROJECT we would like to let you know that you don’t love this park more than we do. We were born here in Rwanda and we know the names of all animals in this park. We have breathed the fresh air from this park before you could even know it existed. Our grandparents used herbal medicines from this park our mothers sung beautiful songs praising this park before your parents could know that there is something called VIRUNGA. Don’t come to lecture us telling us how we should protect this park. In 1991 RPF was there selling charcoals I was a baby but when I went to school I tried to look for one of your articles whether there was one talking about the RPF illegal logging in the National Park of Virunga but I found none. There are also no significant differences between Mr. Kobler, ENOUGH PROJECT, and Gen. Romeo Dallaire in 1990s. He was an Anti-Hutu as people then and helped to propel RPF to power after the downing of the Presidential jet that was carrying two Hutu presidents Habyarimana Juvenal of Rwandan and Ntaryamira Cyprian of Burundi. The same things Mr. Kobler and Enough Project are doing waging two wars the same the Western media waged the propaganda war against innocent Hutus in 1990s that is the same path that Enough Project that has been treading since its formation to spread propaganda against FDLR in Eastern DRC. As Mr. Romeo Dallaire waged war against innocent Hutus who were defending their independent nation in 1990s that is the same war that Mr. Kobler has been waging now against FDLR and hundreds of thousands of Rwandan Hutu refugees including children, women, and elderly people just simply because they are Hutu according to Mr. Kobler they must die even though their survived the RPF brutality since 1990s now you are ready to launch the last attempt to wide them out of the surface as you did in 1990s and 2000s. However, no weapon formed against innocent children and women will prosper, thus says the Lord. Your propaganda and military campaign will still leave us stronger than you found us. This is Africa and we are here to stay until justice is done for us and people are free from Kagame’s oppression. 3. Accountability for Congolese army officers. Djinnit, Feingold, Kobler, and Angolan President José Eduardo dos Santos should escalate pressure on the Congolese government to investigate, suspend, and indict Congolese military officers who are suspected of collaborating with the FDLR:The entire system was set up to oppress Hutus and Congolese people since early 1990s. All Congolese know that. Many Rwandophone people are in the Congolese army and they witnessed how their relatives were killed by the Tutsi movement that comprised of Rwanda, Burundi, Uganda, and Banyamurenge. We Congolese witnessed how our people were killed by Kagame’s military campaign. The people of Rwanda origin have been subjected to humiliation and extermination campaign since 1990s. There is no way Congolese officers who have been oppressed this long will ignore the call from FDLR because they know well that their peace and freedom depends of democracy in Rwanda. SO please don’t be naïve look for practical solutions don’t continue going around the same way you did in Somalia and Vietnam. It did not work then it is not going to work on FDLR. 4. Work to apprehend FDLR leader Sylvestre Mudacumura and encourage public indictments. Djinnit, Feingold, and dos Santos should urge MONUSCO and the Congolese government to cooperate with the International Criminal Court, apprehend Mudacumura, and strengthen the case against him: Dear Enough Project, all your writing is an anti-Hutu propaganda. Mr. Mudacumura did not commit more crimes than Paul Kagame, Kayumba Nyamwasa, Jean-Marie Runiga Lugerero, Sultani Makenga, Laurent Nkunda, and the rest. However, in your previous reports you always mitigated the gravity of the crimes committed by Gen. Ntaganda and a likes simply because they are Tutsis and Mudacumura is a Hutu. The UN Mapping report shows us that Kagame and his cronies killed more than 6 million Rwandans and Congolese in DRC how come you have never written anything regarding the justice of the UN Mapping report? Has Mudacumura committed more crimes than all crimes committed by the mentioned people? 5. Third-country resettlement. Djinnit, European Union Representative Koen Vervaeke, and Feingold should finalize negotiations with countries outside the Great Lakes region and develop concrete options for resettlement for FDLR combatants who are not indicted for atrocity crimes and who have a fear of return to Rwanda. Such offers should include the protective measures necessary to encourage increased defection: FDLR combatant don’t have to be resettled in another country. They have a home which is called Rwanda have all the rights more than anybody else to go back to Rwanda. Instead of wasting money and resources trying to protect your henchman Kagame FDLR must be given a political space in Rwanda so that all of us the people living in this Rwanda we can be proud of our country and we should not have any more refugees outside of Rwanda. You are insensitive people who always want to avoid the real solutions. What is hard to create a UN corridor to protect the FDLR combatants and their families to go back to Rwanda the same way your helped FPR to go back to Rwanda do the same for FDLR? In fact it will be much easier and less costly for the FDLR people coming back to Rwanda because they have families, relatives, loved ones unlike FPR which was based in Uganda and had no people in this Rwanda but you went ahead and helped them not only to come back to Rwanda but to take over power. FDLR is not asking to take over power is asking to simply allow them participate in the Rwandan politics because they are Rwandans there is no reason they should be taken into exile again. If you want combatants to take into cantonment in the third country please take M23 FROM Uganda and Rwanda and take them wherever you want because they have no place but FDLR has a country which is Rwanda and whether you like it or not they will come back home. They are Rwandans. 6. Refugees. Djinnit, Feingold, and Kobler should work with the U.N. High Commissioner for Refugees (UNHCR) to set up protected camps for refugees in eastern Congo. The envoys should also ensure that MONUSCO provides security for the camps: I hope FDLR won’t be tricked again and allow its family members and refugees to be put in the refugee camp as this report biasedly put because we all Rwandan Hutu refugees understand what UNHCR did to us in 1996 and in Tingitingi and elsewhere. UNHCR is not an organization that Rwandan Hutu refugees should trust because in 1990s UNHCR assisted RPF to infiltrate into camps and poisoned water, and stocked arms, and gathered intelligence. The result was the destruction of the Rwandan Hutu refugee camps in Eastern DRC. We are not ready to undergo the same horrible experience again. FDLR is composed by Rwandans who want to go home back to Rwanda they want no any kind of support apart from political space in Rwanda. If you loved refugees you should be telling us what is happening to innocent woman by the name Victoire Ingabire who went back home after 15 years in exile and when she arrived she was thrown into jail for 15 years now you are writing about things which have no academic and intellectual basis at all but a mere propaganda designed to continue supporting RPF as you have always done in the past. 7. Security guarantees. Djinnit, Feingold, and dos Santos should work with Rwanda to provide an improved security plan that is co-signed by international actors and to issue a new statement that would outline more concrete plans for security and non-prosecution guarantees for FDLR combatants not indicted for grave crimes. Rwanda has had a policy to date, but security deals that have been reportedly broken have made FDLR fighters not trust the current arrangements. A new revised program, co-signed by the United Nations and/or the Southern African Development Community (SADC), could help spur more defections from the FDLR: If there is any guarantee that Kigali can give to all Rwandan refugees is to let people exercise their political rights without fear and favor or intimidation. That is the only gift the Western countries, especially America can offer to the people of Rwanda as an apology to the ordeal we Rwandan refugees suffered in the hands of UN. 1. Going back to the discussions that were facilitated by the San Egidio, which calls for the establishment of democratic institutions in Rwanda so that people are free to participate. 3. To call for an inter-Rwandan dialogue that discusses political issues that have divided Rwandans for years and be discussed openly so that people are heard equally. 4. To set up a taskforce that involves UN, International community, and regional bodies to discuss the issue of military and demobilizations that will prepare for the establishment of national forces instead of a political force like the one that characterizes Rwanda today. 5. Lastly, to establish a Truth, Justice, and Reconciliation commission that will work to write a new constitution that will put in place judicial, healing, and reconciliation mechanisms that will play a bigger role in national reconstruction and healing initiatives. Without these five elements being tried those who think they understand what could resolve FDLR and security issue in the region should forget about it. FDLR is no longer a small fraction of 6000 fighters but a movement that represent over 80% of Rwandans and has mobilized enough support of younger generation both inside and outside Rwanda. FDLR is here to stay unless its demands which are the demands of most of Rwandans are respected and worked on seriously, the world should be ready for another 20 years of FDLR in the region. FDLR is not any kind of a rebel movement just has no ideology and a following. FDLR has the people who are anxiously counting on it for their freedom, independence, patriotism, nationalism, and belonging. That is what most of the Rwandan people feel when the world FDLR is mentioned. To solve its problems one must be ready to accept the reality.